Liat Yossifor: Pre-Verbal Painting at the Contemporary Art Museum (CAM) highlighted new work by the Israeli-born and now California based artist. Ranging from almost pocket-sized painting to the attention demanding large-scale, 60 x 62 inch canvases, Yossifor’s abstract, gestural paintings show thickly applied paint, worked across the canvas in sometimes long, sometimes short strokes. The six canvases that make up Pre-Verbal Painting share a monochromatic color palette, mostly consisting of a light gray, almost white, with hints of blues, yellows, reds, or greens showing through. In creating these paintings Yossifor worked with a set of rules created by herself, guided by the nature and size of the canvas, and the paint itself. Each painting is done over a three-day span, where initial base colors are applied and then worked and reworked by her hands, brush, and tools. Over the course of that time the colors combine and transform into a muted gray, a result of the process as much as a choice. While they are all bound by time, the larger pieces are bound by the physical traits and limits of their creator. The lines, the gestures, and the movement of the paint is defined by the way in which a body moves. As Yossifor moves throughout the layers of paint, her reach and range of motion determine the composition. Yet, even while working within a set of rules, Yossifor has the freedom to work toward a visual goal. Through re-working and editing she has the ability to present a painting that is visually striking and emotional. The process of painting follows the established tradition and method of Action Painters from Abstract Expressionists in a very modern and contemporary way. The act of painting the performative nature, creates an artwork larger than painting itself. For the artist, the movement within the paint, the personal connection from her skin molding the paint, the psychological connection of a trance-like subconscious state is part of the finished art. 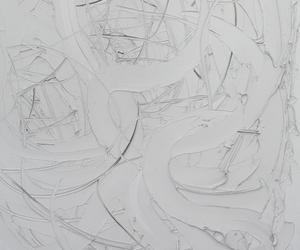 And, for the viewer, it is not hard to imagine the movement of her arms, pushing paint against gravity creating thick walls as her hand stops and joints turn over to allow a change in direction. We see the paint smooth as a final pass cuts across incised and engraved lines, thick from hands and palette knives or thin from bush handles. Behind the process, Yossifor’s Pre-Verbal paintings show contradiction. The monochrome gray is a result of mixing colors. The limited, unembellished palette fights against the active nature of the composition. Yossifor describes the result as a “structure from a lack of structure.” And there is the secret that Yossifor hides behind her work: the paintings are abstract but there is absolutely a pictorial quality to them. Working within her tightly constructed rules, she still manages to make the decisions that determine the outcome of the piece.